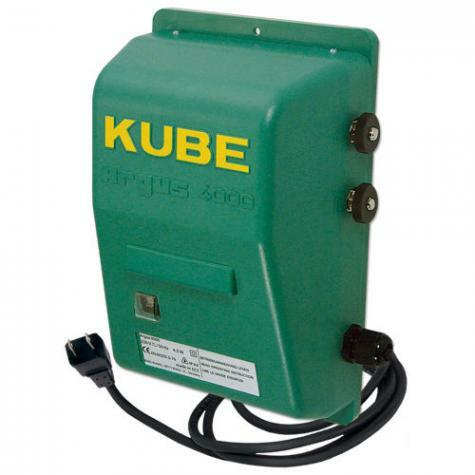 The Kube 4000 plug-in unit is economic and wide-impedance. That means it produces unusually high pulse outputs in fences over dry soils. It performs better than standard low-impedance units during dry/snowy seasons and on fences for deer, poultry and goats. It's proven, over the past 5 years, to offer reliability and excellent value. To help simplify your purchasing decision, look to a Kube 400 Plug-in Kit. A 110v electric fence energizer used for medium length fences. It will keep in cattle, sheep, goats, horses, poultry and guard dogs. Effective at protecting against coyotes, stray dogs, bear and fox. It also works to keep deer, raccoons and rabbits out of garden/orchard areas. Simple. No fancy "bells and whistles." Modular. Very easy to repair. 3 miles of 3 strand cattle fence. 1 mile of 5-7 strand sheep fence. 15 rolls of 164' sheep/goat nets and 7 rolls of 164' PoultryNet. * All distances are dependent on amount of grass/weed load on the fence. Wide-impedance units perform better over a wider range of fence conditions and conductors than standard low-impedance units. Areas where wide-impedance units excel are: high resistance conductors (stainless steel polywire/hot tape/electrified netting); minimal ground rods; livestock or wildlife with dry skin or hair (poultry, deer, goats); and very dry soils. Safe to use with all polywire, polyrope, tape and electrified netting. The Kube 4000 can be mounted either inside or outside of a building, but not where there is risk of fire. The energizer must be mounted vertically. Protect the energizer from direct rainfall. Connect insulated cable (stripped back 1 - 2" on ends) to the fence terminal on energizer, run the cable to the fence line and connect. Then run a second length of cable from the ground terminal (with ends stripped again) on the energizer to the ground rod. Secure to ground rod with a clamp. Plug into outlet and test fence. Unit indicator light should flash and a tic-tac sound will be heard. If the indicator light doesn't flash, then the unit should be serviced. If the fence is at fault, then you must find the fault(s) and fix them. Reduces risk of lightning damaging an energizer by redirecting the energy to the ground. This reliable, single-throw cut out switch stops the flow of electricity from one fence to another. If you intend to build permanent electric fences, you're going to need double insulated wire. We're small hobby farmers in Florida and have been using Kubes for about three years and have 4 currently. They’ve continued working perfectly despite being outside in the elements, including being halfway submerged for hours after our frequent thunderstorms. We’ve never had any losses to predators while using a Kube - and once it killed an armadillo that got tangled in the netting! I was using a low impedance fencer on my electric fence for my horses. It worked fine this summer but once we got snow and a great deal of ice this winter , it was sending a very weak pulse that had no shock value. We have sandy soil also. In researching the problem, I came across information that convinced me I needed a wide impedance energizer. The only one I could find was the Kube 4000 Energizer online. It had good reviews so I decided to give it a try. I am now receiving a 5500 v plus pulse through my fence. I am well satisfied with this energizer. An excellent product. We’ve used one for ten years without a single problem and bought another for a new pasture across the road. Wouldn’t hesitate to buy a 3rd. A great little energizer. It does a much better job of generating a charge to the fence no matter the ground moisture conditions. We use this on portable fencing to rotationally graze a small herd of sheep and it works wonderfully. Excellent energizer with no fancy bells and whistles but it will sure pop your tale. This energizer packs a punch and really works. We use it to keep our sheep and a ornery bull in their appropriate areas. We have had no issues at all, and we will probably be purchasing another in the near future.